Even with snow on the ground, it is not too early to begin thinking about spring and how to ease the transition from cold to warm weather for trees and shrubs. Rochester Hills, MI, February 13, 2018 --(PR.com)-- Even with your trees and plants still covered in snow, it is never too early to begin thinking about the coming spring and warmer months and start preparing your property for the growing season. 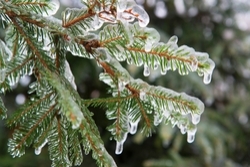 At Safari Tree, lead Tree Manager and Certified Arborist, Erik Hutson, has some simple tips on how to ensure that your trees and shrubs transition from the cold to the warm. With the holiday season over, it is important that if you decorated your trees and shrubs with holiday string lights that you remove them and any other form of decorations from the plants. As trees continue to grow each year, having lights wrapped around the trunk and/or limbs could potentially impact the health of the tree by constricting the limbs from developing. If you prepared your plants prior to the winter months by wrapping or covering them with burlap or other protective materials in anticipation of the harsh Michigan winter elements, it is important to make sure that once the temperatures are no longer at freezing levels, you are removing the coverings. By waiting to remove the coverings could compromise the health and stunt the growth process of the plants. Once the snow begins to melt away, make time on the weekends to rake and remove any and all debris, leaves and fruit that may have dropped over the winter months. Leaving them unattended can lead to the potential germination and spread of diseases that can overwinter in the debris - for example, tip blight and apple scab. In addition to removing the debris under the tree, it is important to add mulch around the base of each tree on your property as this will help in protecting the tree trunks and its roots from any damage. The mulch is more to protect from damage it may sustain and will still be present the following fall/winter and will continue to protect the trees root zone at that time. Safari Tree recommends no more than 3” of mulch around the base, but make sure to keep the bark from the trunk as the bark can and will withhold moisture which can cause tree rot. It is also important to prepare your plants for the growing season by applying a light round of fertilizer, as the fertilizer will give the plants the needed help with the transition from the cold weather to the warmer weather. Finally, Safari Tree recommends that in the early spring to prune out the dead limbs of the trees and the best time to do so is when the trees are still dormant. However, if you are not sure what branches are dead or alive, as the trees are budding, you should be able to discern between which limbs are coming out of dormancy and which are not. While due to the current weather conditions, all you want to do is sit in front of the fire, it is definitely not too early to start thinking about the coming spring and how to prepare your property to come back healthy, green and lush. Safari Tree offers a comprehensive 7-step tree healthcare program for customers in Southeastern Michigan. For more information on tree and shrub healthcare, contact Safari Tree at 844-500-8733. Lush Lawn | Safari Tree is proud to provide lawn and tree care for thousands of homeowners, commercial businesses and public properties in ​Southeast MI and its surrounding areas. Our lawn & tree care services allow our customers to enjoy the beauty of their lawns and landscape more; we provide seasonal and year-round landscape maintenance, tree service and preventative weed and disease control, as well as professional pest control services. All of which, give our customers greater peace-of-mind knowing their landscape maintenance, trees & shrubs are taken care of.